Services — Sign Street — Creative Minds. Creative Signs. At Sign Street, we take the time to listen to your needs and work with you to find a custom solution that exceeds your expectations. Customer service is a priority for us as we strive to be a business that you know, like and trust. We make every effort to give you the best quality at a reasonable turnaround time, and always work within your budget. Getting started is a phone call, email or visit away! Tell us what you’re looking for or send us an example and we can recommend the best approach to completing your project. Whether it’s recommending a weather and use appropriate material for your outdoor signage, or finding a unique way to show off your brand, we’ve got you covered. Once the scope of the project is outlined, we’ll provide a quote so you know what to expect before we get started. Now for the fun part! Our professional designers will produce eye-catching graphics for your project. At this point we welcome you to collaborate with us to find a final design that compliments your brand or personal style perfectly. Once you’re happy with the look and feel, you’re ready for the final stage in the process. Time to bring those amazing graphics to life with printing and installation. 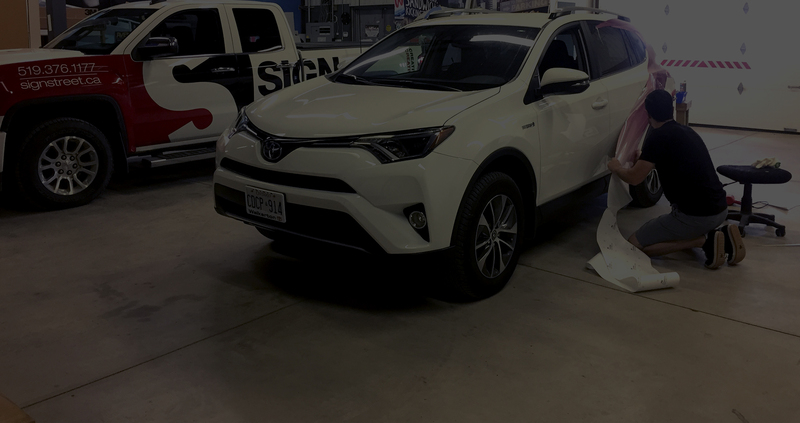 We install everything we print, including vehicle graphics in our onsite shop, billboards, and even custom signage. We have an in-house printer for smaller print items or we partner with a printer that can provide fast and reliable products. In everything we do at Sign Street we aim to provide the best service possible. 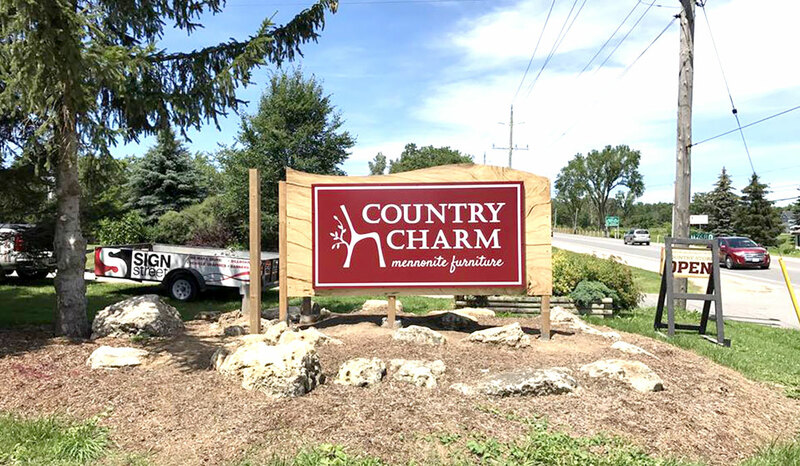 Backlit, dimensional, indoor, outdoor, store-front signage, A-frame signs, custom mailbox, address sign, yard signs, and window clings. Highway billboards, distance testing, digital signage, and building signage. Vinyl graphics, decals, full coverage, window graphics, professional application, and quick turnaround. Logo design, brainstorming, taglines, brand guide creation, colour palette selection, and brand identity. Business cards, letterhead, envelopes, email signatures, brochures, and logo plaques. Posters, brochures, invitations, rack cards, calendars, flyers, postcards, stickers, direct mailers, door hangers, and presentation folders. Pull-up banners, foam boards, vinyl banners, banner stands, flags, gallery designs, and event booth design. Pens, padfolios, magnets, sunglasses, blankets, table cloths, cups/mugs, note pads, shirts, jackets, and more. With a trained contractor on staff, Sign Street can not only print and install your signage, but we can also help with storefront renovations and upgrades. This includes replacing awnings, painting and installing doors or windows, in-store displays, and constructed signage with stone and landscaping. We can bring your storefront vision to life, give us a call! We use only high quality 3M vinyl which allows us to apply and reposition the vinyl until it’s perfectly set and bubble free. Customize your design with textures like embossed details and carbon fibre vinyl. Sign Street is equipped with a state-of-the-art printer for all your printing needs, with fast turnaround and affordable prices. We’re your local source for posters, flyers, folded brochures, stapled documents and more! Looking to venture into the world of digital? Through our sister company, Avenue A Advertising, we have in-house capabilities for all things digital, including: websites, social media, email marketing, SEO, search engine advertising, digital signage, and more. If you’re looking for help with your brand online, we can help! Contact Avenue A today for more details. Like or follow us on these social networks and let’s keep in touch!